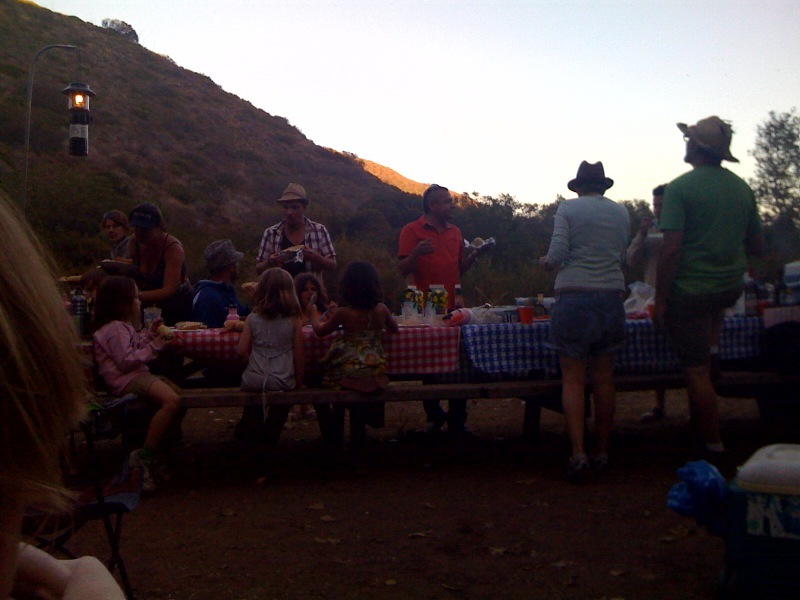 On Wednesday we joined our neighborhood gang at Sycamore Canyon for dinner. We were suppose to camp out with them but I’ve been exhausted lately. D was on a three day shoot, I dealt with the cable guy all morning and I just didn’t have it in me to rent a tent, etc. 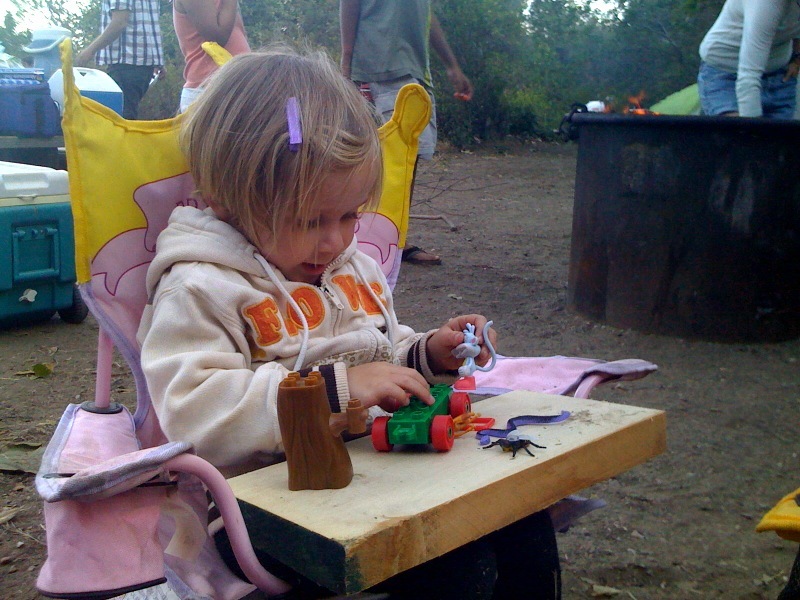 We….I haven’t been into camping until now, that we have P, therefore we have minimal camping gear. On my “to-do” list to stock up. P and I got home late on Wednesday night. Thursday morning I finally got her into a bath at about 10am and in the final rinse of her hair I found a tick on P’s left ear. I flipped and went into commando mode. I grabbed tweezers. The only thing that came to mind was “disinfect and take the entire creature out”. I got the entire tick and put it in a jar. I put alcohol on P’s ear and she of course started crying. The tick took skin of her’s with it so there was an open wound. The girl has balls. That’s all I can say about P. She cried minimally. I think she thought the burning sensation of the alcohol was the tick biting her. She just wanted to know it was out. Then she calmed down. So, long story short we ended up at the ER today because this morning I saw red streaking lines coming from the bite. She had some puss. I called the doctor after she went down for a nap and he suggested we take her to urgent care. After her 3 hour nap we went to the Pediatric Urgent Care only to find that they don’t take our insurance company, Motion Picture Health, because MPH doesn’t pay their bills. Nice! Many urgent care centers don’t do pediatrics. In an effort to save time we went straight to the ER. D and I debated as to whether it was worth it to go to the ER. Could it wait till Monday? The streaking was almost gone by the time we arrived at the hospital. Which of course makes me look like a lunatic mom putting my kid through the whole ER experience for a minimal thing. But I was worried it could get worse again. And why is it that when the doctor explains what to look for seems it’ll be obvious. But when it’s actually happening it doesn’t seem that bad so it’s hard to tell what to do. 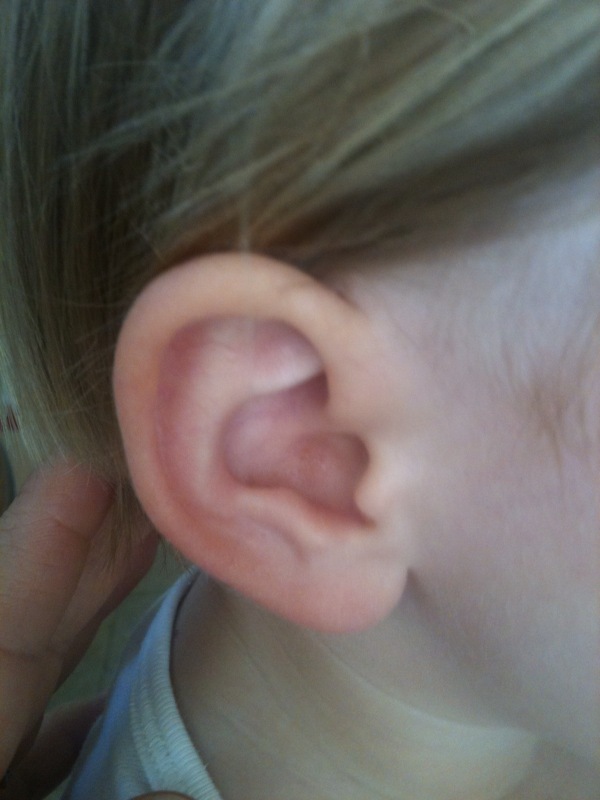 This is what her ear looked like this morning. Left ear. The one that got bitten under the top fold. It doesn’t seem that red…. 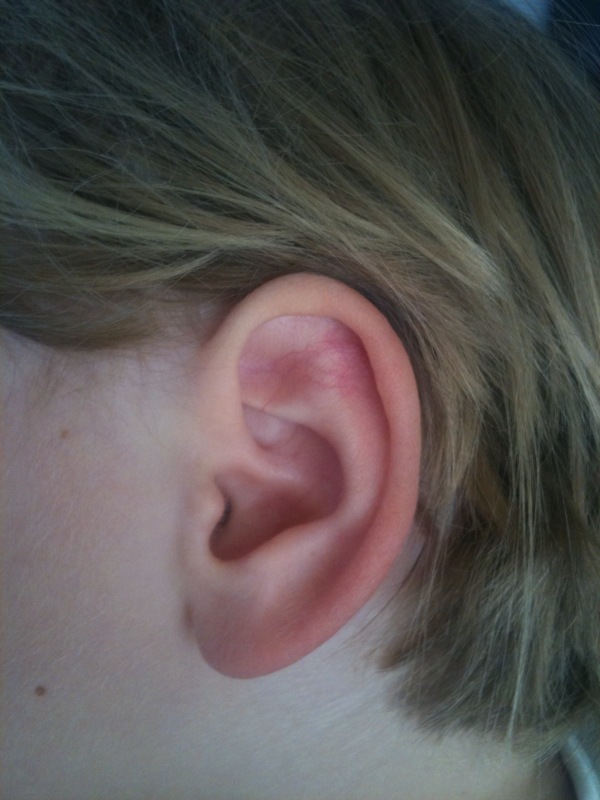 …until you compare it to the right ear. I’m the type to nip something as it’s getting worse not when it’s full blown. We were given antibiotics, amoxicillin, just to cover all our bases from anything infectious. It seems the reaction she got could have happened with any kind of bug bite. Ticks don’t transfer Lyme disease until they start the feeding process which doesn’t begin until 36-48 hours after latching on. You can visually tell because they start to fatten up. Heating or suffocating a tick can cause it to release it’s toxins into the skin more so than just pulling it from the head. Lyme disease isn’t the only disease of concern with tick bites. The reaction from a bite can erupt weeks for months after a bite. I should always know where to take P in case of emergency. We were lucky to have had this “non-emergency” situation so that in the event that a real emergency comes up we now know which hospital and entrance to go to etc. Our camping gear needs to include a first aid kit, specially things to deal with ticks. DEET is not good for children….or adults really. When D was in Malaysia he put DEET on every day and his tough rubber banded watch deteriorated from the stuff. 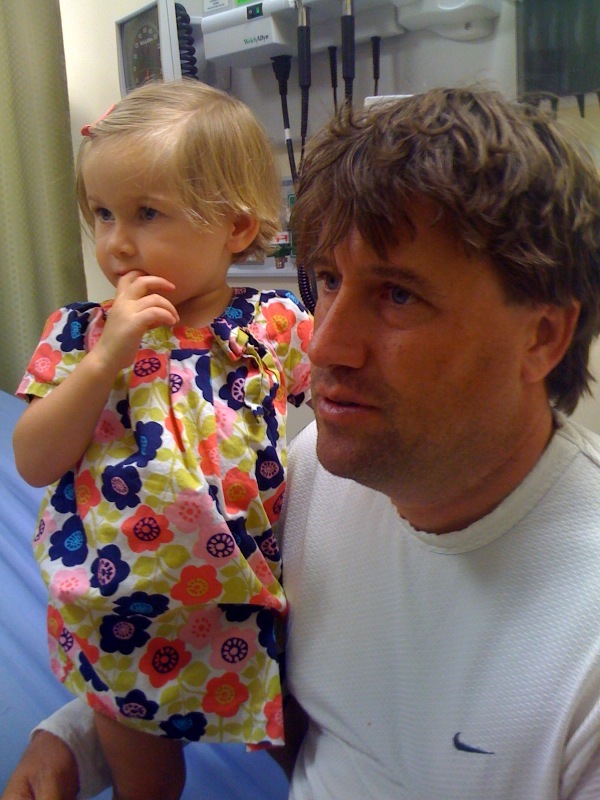 Our time in the ER was really great considering the circumstance. The doctors and nurses were lovely and Providence Tarzana Medical Center. Afterwards we went to dinner at a local BBQ place. I had a craving for meat. We laughed when P showed the waitress her ankle bracelet from the hospital. In the bathroom P says to me ” I like this place Mamma. This is a good place. ” I asked why and she said “It makes me feel good.”….probably because she didn’t eat an entire vegetable during dinner. I was too exhausted to worry about it. But it was the first time I’ve heard her express emotion/desire/feelings so well. 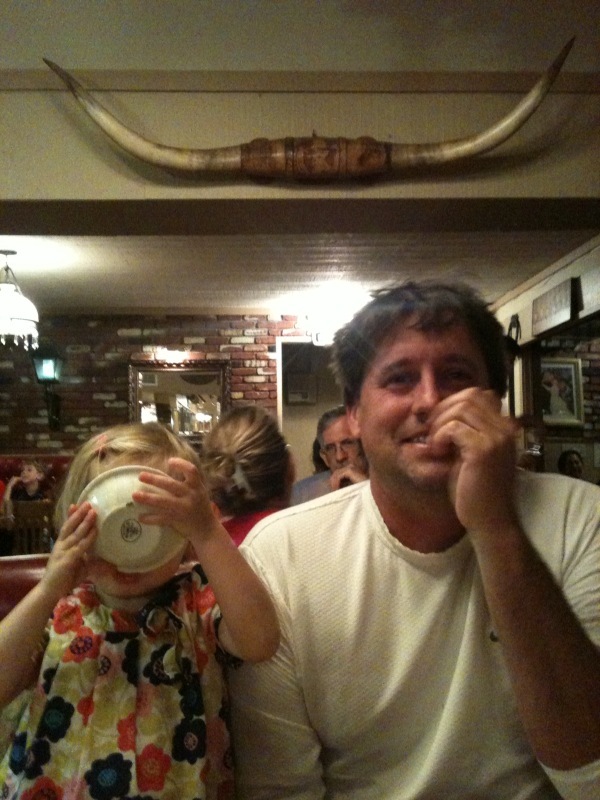 When the ice cream arrived she started eating. Then she stopped and reorganized the plate and bowl. “It has to be right” she said. D looked at me. Definitely MY child. And then she picked up the bowl and slurped the rest of the ice cream directly into her mouth. I looked at D. Definitely HIS child.